Last year, I wrote a review for the book Introducing Albion Stitch, written by Heather Kingsley-Heath. 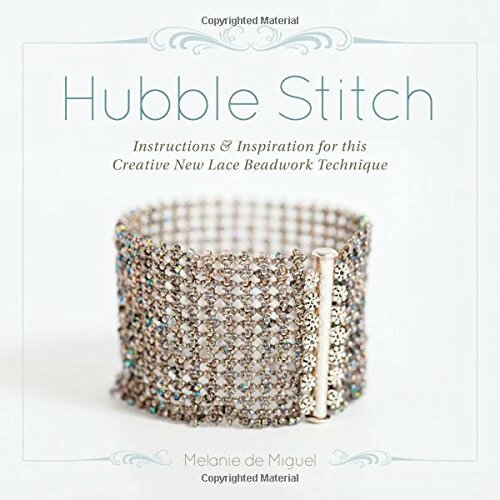 I liked how thorough the book was and I also liked all the projects that Heather included. 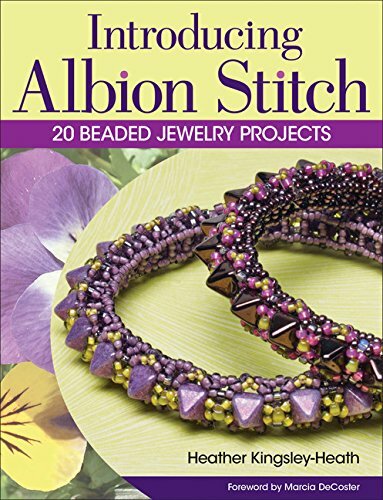 Albion Stitch is not difficult to do, but I recommend you get Heather's book so that you can see all of the variations she includes. 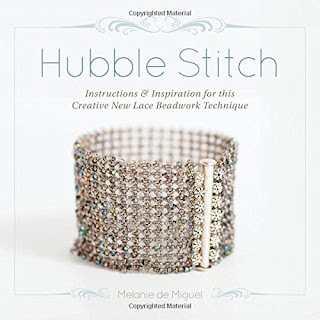 I will not teach the stitch in this tutorial, because it's not mine to teach, but you can take a look at either of these online resources if you need specifics. 1. 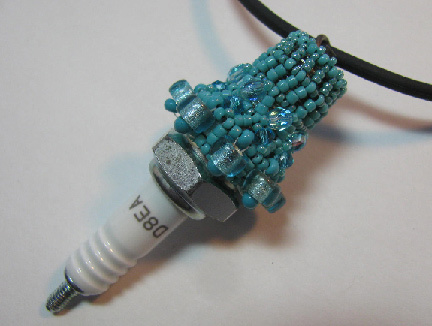 Anchor a row of seed beads around the middle of the spark plug. Add a row of albion stitch, spacing it at regular intervals around. 2. 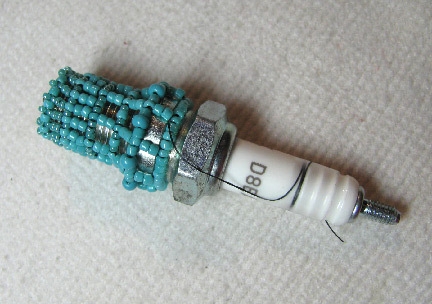 Add as many rows as you need or want, to reach the top of the spark plug. 3. Go back to the bottom and embellish the structure as you desire. I used large e-beads, crystals, and glass rounds. 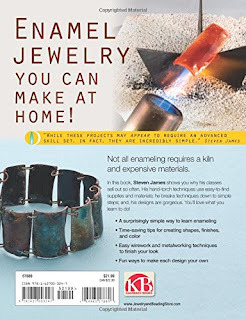 Here's a wonderful new skill for you to add to your jewelry-making repertoire! In Discover Torch Enameling, Steven James teaches you from the ground up how you can make your own colorful components, pendants, charms, and wired shapes. 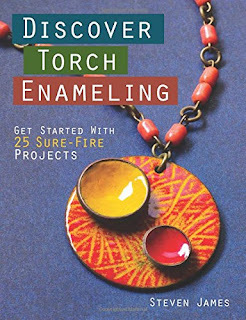 Although torch enameling isn't as difficult as you might think, there are technical and safety concerns to be aware of, and Steven guides you through them while still maintaining a light-hearted approach. All the technical and basics information is right up front in the introduction, and then it's on to the projects. 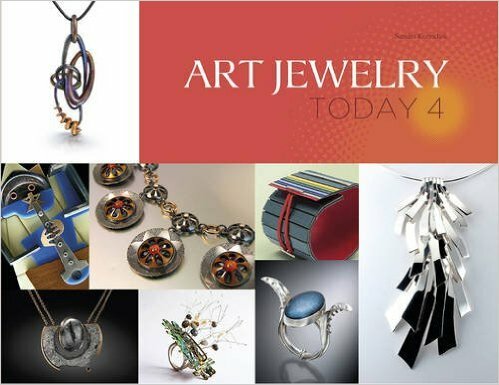 Twenty-five projects are divided into five categories: projects to get you started and let you gain confidence; playing with different finishes, including raku; enameling wire shapes; manipulating the shape of metal; and creating enameled connections. My favorite project is probably the raku bracelet shown just above. Since you are using burning paper and leaves, you never know exactly how the pieces are going to turn out. Whether you have done some enameling in the past and want to improve your skills, or if it's all new to you, this book full of projects may be just what you've been looking for! 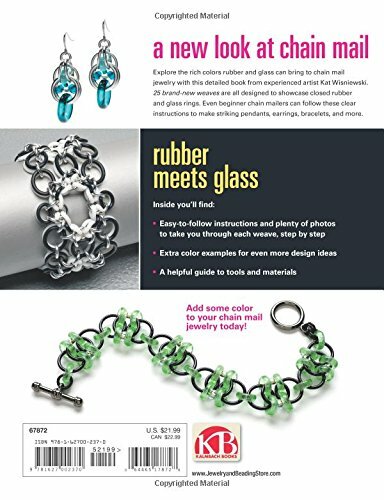 Who says that bead stringing has to be basic or boring? Not so, if you think about adding layers! I'm sorry to say that I do not have process shots to share for this tutorial, but if you've been stringing for awhile, you won't have any trouble figuring it out. To make this necklace, I used vintage buttons with holes (not shanks), large ametrine nuggets, a charm bracelet chain, and a mixture of beads: size 8/0 seed beads, pearls, small amethyst nuggets, glass rounds and faceted rounds, and a few size 6/0 seed beads. You should chose the materials and colors that most interest you. You'll also need super-flexible beading wire, a head pin, and these tools: wire cutters, chain and round nose pliers. 1. Cut your bracelet in two so that the clasp side is about an inch or so long. The clasp will go in the middle as shown above. 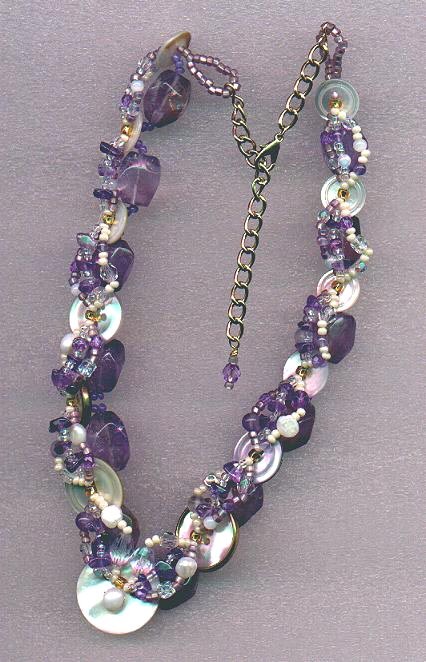 Create a loop of seed beads around one end of a piece of chain and begin to weave your necklace as follows. 2. 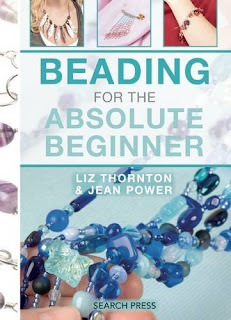 Stitch through a button hole and pick up a size 6/0 seed bead. Stitch back down through a second hole. Pick up a few size 8/0 seed beads, a large nugget, and a few more size 8/0 seed beads. Stitch up through a hole in the next button. I suggest arranging the buttons so that they are graduated in size, keeping the largest in the center. 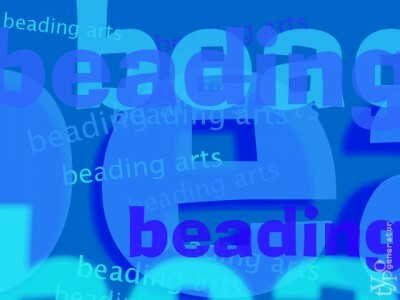 Pick up another size 6/0 seed bead and repeat around. 3. 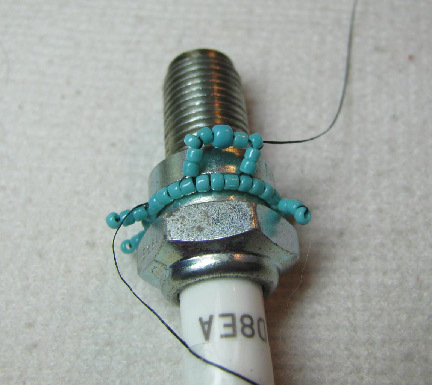 Create a seed bead loop around the other piece of chain at the other end. 4. Add three more passes of stitching, but on the opposite side of each button from Step 2. Stitching through each size 6/0 seed bead, add a strand of mixed seed beads and small accent beads, stitching from one size 6/0 to the next. When you get to the end, turn and add another pass. Repeat until you have at least 3 strands. 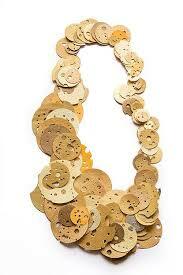 You can add more if the large seed bead holes will accommodate it. 5. 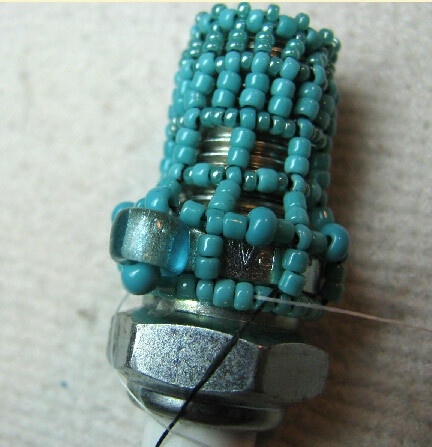 Place a few small beads on the head pin and turn a wrapped loop around the end of the chain without the clasp. Your necklace is now adjustable. 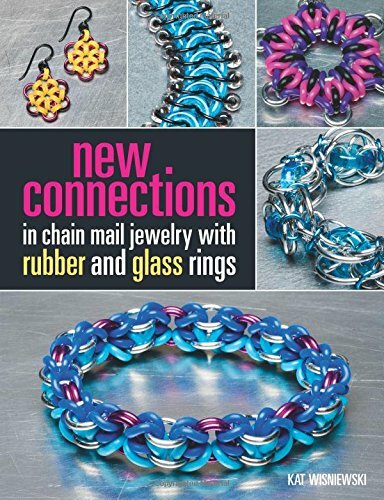 Do you like chain mail jewelry, but wish it had more color? One of the easiest ways to add color is to integrate glass and rubber rings into your work, and Kat Wisniewski shows you how to do this in her new Kalmbach publication, New Connections in Chain Mail Jewelry with Rubber and Glass Rings. 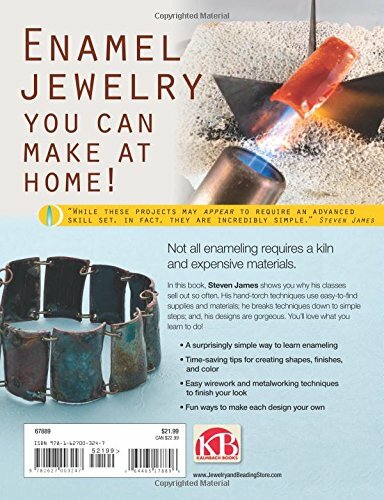 Other sources of color, like enameled copper rings and anodized aluminum rings are not ignored, but the projects in this book let the rubber and glass rings take center stage. Kat goes over the basics and pays particular attention to good technique while opening and closing rings...and frankly, since that's mostly what you do in chain mail, it makes a lot of sense to get it right! She also has a great chart on pliers, and she covers the basics of inner and outer diameter, wire gauge, and aspect ratio too. But mostly this book is about the projects. Each of the 25 projects has a list of exactly what you will need to make it as shown, plus some color options. Kat explains which weave is the basis for the project, but this isn't really a book that focuses on weaves and their families so much as on projects. No worries...there are plenty of books out there that teach all the weave families. 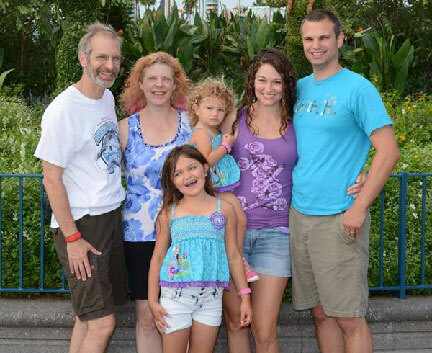 This book focuses more on the color and the fun!